The Texas Mountain Laurel, Sophora secundiflora, is an excellent landscaping shrub. It is an evergreen with thick, dark-green foliage and a small, bushy size. It is often used in xeriscaping because it is very drought tolerant (and attractive). Once placed in the right area, mountain laurels grow at a slow and steady rate. Each summer they produce bunches of sweetly scented purple flowers. Pick out the mountain laurel that you want to transplant. Whether you are digging up an existing mountain laurel to replant in a different space or buying one from a nursery, make sure it is less than 2-1/2 feet in height. Mature mountain laurels do not transplant well. Decide on where to plant your mountain laurel. It should be an area that receives full sun if you want it to bloom. While mountain laurels will still grow in shaded areas, they will more than likely not bloom. The soil should be well drained. Use a shovel to dig a hole in which to place your mountain laurel. The hole should be at least twice as large as the root base. Place the potting soil in the bottom of the hole. There should be enough potting soil so that when the plant is sitting in the soil, the roots are sitting just beneath the surface edge of the hole. Dig up your mountain laurel for transplanting. If you are taking the plant out of a pot, press the sides of the pot to loosen the soil and roots. Gently pry the plant from the pot, taking care not to damage the roots. If you are digging the plant out of the ground, use a shovel to dig. Start digging far enough out from the base of the plant to ensure minimal damage to the roots. Gently dig underneath the plant and lift it out of the ground. Loosen the roots of the mountain laurel slightly, taking care not to damage the roots. Place the mountain laurel in the hole on top of the potting soil. Gently fill in potting soil to completely surround the plant. 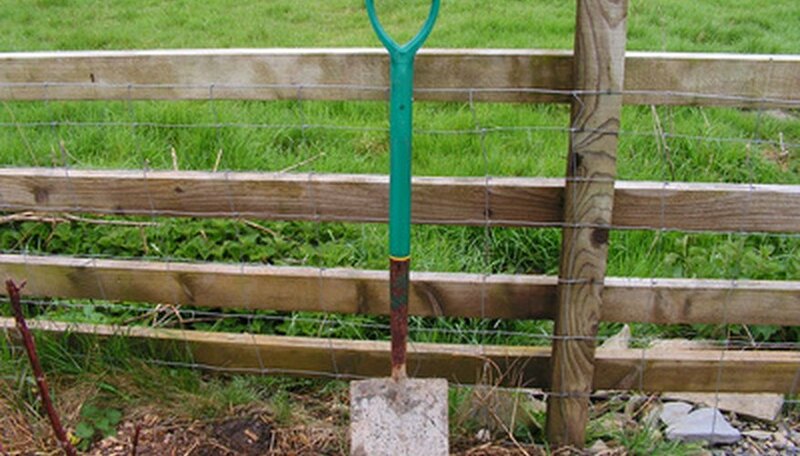 Pat the soil down so the plant is securely in the ground and does not move. Water the plant well. When you first transplant a mountain laurel, you will need to keep it well watered at first. After it is established, however, it does not need supplemental watering except during periods of extreme drought and just before the ground freezes in winter. Fertilize your mountain laurel twice a year with a small amount of fertilizer for acid-loving shrubs in early spring and late fall. Throughout the year, you can place a 2- to 3-inch layer of organic material or mulch around the plant to help protects its roots and to retain soil moisture during periods of heat or dryness. While fertilizing a mountain laurel will make this slow-growing shrub shoot up faster, it will also inhibit blooming. To ensure a nice annual show of flowers, fertilize only once or twice a year. The mountain laurel is an evergreen but is susceptible to winter burn. If your mountain laurel is not protected from wind by a natural shelter, create a protective screen out of burlap to protect it. Take care when wrapping it to ensure air circulation is not blocked. Overwatering can kill mountain laurels. Water generously when the mountain laurel is first transplanted, but avoid overwatering established plants.